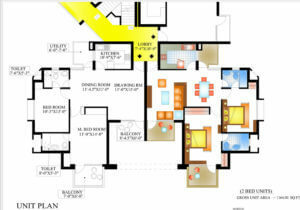 Good Floor Plans is very important for apartments. In order to impress people with the first look, the apartment is given with full preference of the customer. 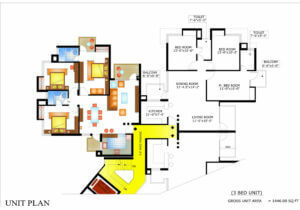 If you want to buy 2 BHK, then you can take a look at the floor plan given below. You will find an upstairs way in outside. After that, you will find the lobby. At the right side of the lobby, you will find kitchen room. After the kitchen, you will find bedroom attached with toilet. After your few steps by foot, you will find dining room. After the dining room, you will again find a bedroom. Outside of the bedroom, to just some steps to left, you will find out the toilet. The balcony is being attached to the bedroom. It will impress people with three large enough sized bedrooms. Initially, you will find a wide passage. At the first entrance, you will reach the living room. At some steps to sideward, you will reach the kitchen. If you move from the kitchen, you will find dining room. Once you start to move sideward to the dining room, you will find a bedroom. Two balconies will impress you. After a bedroom, you will find another two-bedrooms. Both of them are being attached to the separate toilets.